Running back Jamaal Charles spent nine seasons in Kansas City. 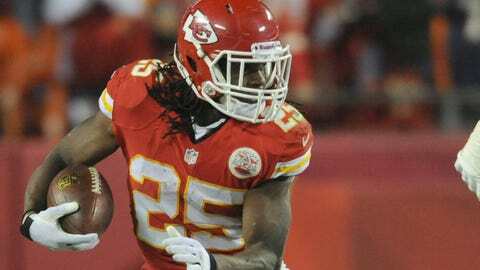 JACKSONVILLE, Fla. — The Jacksonville Jaguars have signed former Kansas City Chiefs running back Jamaal Charles to help during Leonard Fournette’s absence. The 31-year-old Charles worked out for the team Tuesday morning and signed a one-year contract in the afternoon. The Jaguars (3-2) lost third-string running back Corey Grant (foot) for the season and expect to be without Fournette for several more weeks. Grant was placed on injured reserve, opening a roster spot for Charles. Charles should be able to pick up the offense quickly and make an immediate contribution Sunday at Dallas (2-3) while playing behind T.J. Yeldon. Charles spent nine years in Kansas City and played 14 games with Denver last season. He has 7,556 yards rushing and 44 touchdowns, plus 2,586 yards receiving and 20 more scores. The Jaguars also signed rookie running back Dave Williams off Denver’s practice squad and released first-year back Brandon Wilds, who was a non-factor with the ball and a liability as a blocker. The team also placed Austin Seferian-Jenkins on injured reserve and promoted fellow tight end David Grinnage from the practice squad to the active roster. The Jags also signed rookie tight end Pharoah McKever to the practice squad.